Iconic Rock Group Aerosmith begins their Vegas Residency with Shows beginning in April. Aerosmith fans in the Sin City have a reason to rejoice as the rumors of Aerosmith in Vegas are finally confirmed. The Boston hard rockers have officially announced that they will be heading to Vegas to launch the euces Are Wild’ residency next year. According to sources, the Grammy-award winning band will play 18 shows joining the ranks of Lady Gaga, Queen + Adam Lambert, and Blink-182. The residency promoted by MGM Resorts and Live Nation will be the first-ever THX-Certified performance to be presented in an L-ISA Immersive Sound. The band has teamed up with THX and L-Acoustics to deliver an out-of-the-world experience. Producer Giles Martin who was responsible for the sound for Beatles’ Cirque du Soleil show in Vegas will offer rare and unseen audio and visuals from Aerosmith recording sessions. On their plan to launch a residency in Las Vegas, the band’s guitarist Joe Perry said that the team wants to deliver a kind of performance that isn’t possible when they are on a regular trip. With this show, the band wishes to create a performance that has everything that Aerosmith is known for yet deliver something that the fans have never seen or heard before. The Sin City has seen several bands over the years and Aerosmith is one of the biggest rock band legends to grace the city. They are America’s best-selling rock bands of all time with more than 150 million records sold internationally. Steven Tyler, Ray Tabano, and Joey Kramer formed the Aerosmith band in 1970 after signing up with the Columbia Records. They went on to deliver a string of hits such as alk This Way’, weet Emotion’, and ream On’. They also released their self-titled debuts such as anie’s Got a Gun’, and on’t Want to Miss a Thing’. Their 70s heydays marked by sleazy rock and seismic riffs made way for the 80s sensational metal zeitgeist that rode them to a new commercial height. They again made a comeback in the late 80s with some chart-topping numbers. 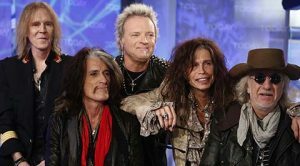 In 2001, Aerosmith was included into the Rock and Roll Hall of Fame; and in 2013, Steven Tyler and Joe Perry were included in the Songwriters Hall of Fame. Unlike their peers, Aerosmith has weathered the shifting tides and sustained in the music industry by constantly reinventing themselves. From the sinister tracks to the sugary hits, their songs appeal to people from all generations and that makes them an indispensable figure in the music world. In other words, Aerosmith in Vegas is sure to attract people of all ages and discerning taste in music. Watch the band dig into their Blues and R&B roots that won them fame and fans nearly 50 years ago, and before they won Grammy and the platinum plaques. Expect the band to play the singles from their classic albums to their finest full-lengths. Get ready to listen to ocks’ oys in the Attic’ and et Your Wings’. Tyler never fails to share some of the fascinating backstories behind the popular gems like ovin’ Out’, which was the first song he and Perry wrote together. Listen to the band play solo tracks from Tyler’s 0s band and Joe Perry’s 1980s debut project. They are all a part of Aerosmith’s 50 years legacy. As a die-hard fan, you can look forward to an ultimate experience of watching Aerosmith in Vegas in their residential act slated to launch next year. Alejandro Fernandez will be performing at the Mandalay Bay Events Center in Las Vegas on September 15th. Alejandro Fernandez (aka El Potrillo) is known for his illustrious career as a mariachi and ranchera singer and pop musician. Music ran in his blood as he is the son of Vicente Fernandez, who is also a pioneer of the ranchera style. His career officially started in 1988, but it was not until 1992 that he released his debut album, bearing his full name as its title. He achieved international recognition when he released Que Seas Muy Feliz, as it contained the song “Como Quien Peirde Una Estrella” which became a hit. This was subsequently followed by hits from other albums, most of which were also generally well-received by audiences and critics alike. The steady release of albums in these early years served to showcase his potential as a great singer. In 1997, the release of his album Me Estoy Enamorando marked his transition into the pop genre. This is a significant milestone in his career as a singer simply because it skyrocketed him into fame. No less than four songs from that album topped the charts that year. The song Si Tu Supieras is worth highlighting, as it is the one that catapulted him to success in the North American charts. From here on, he shifted between creating pop music and ranchera music regularly, while collaborating with other singers and producers. This became a regular pattern in his career in majority of the 2000s as evidenced by albums like Origenes, A Corazon Abierto, and Viento a Favor, which alternated between pop Latin music and traditional ranchera. It didn’t take long for him to be immortalized in the U.S. after he received his own Star on the Hollywood Walk of Fame in December 2005. Towards the latter half of 2009, Fernandez began working on two albums titled Evolucion and Tradicion simultaneously. Both were released at the same time but were clearly made distinct by the respective genres they focused on: Latin pop and traditional mariachi and ranchera music. These two albums, in turn, served to express the entire essence of Alejandro Fernandez’s career. In 2012-2013 he collaborated with other famous artists like Rod Stewart and Christina Aguilera in the album Confidencias, which also happens to the song Me Oldvide de Vivir that he sang as a duet with his father Vicente. The album was highly praised and well-received in Spain and Mexico. His latest album (Rompiendo Fronteras) is another collaboration with other artists. The song Se que te duele became a hit almost overnight. Having reached the pinnacle of his career, it’s safe to say that he has upheld the Fernandez family’s music tradition to the fullest while making a name for himself in pop music. His artistry and political activism shines brilliantly in the types of albums he chooses to release. Incidentally, while he is considerably fluent in English, he still prefers to sing in Spanish as he values his image as a Latino singer more. 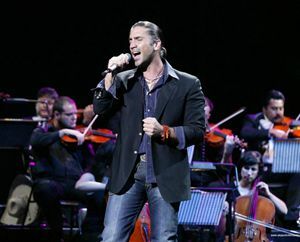 Currently, a performance by Alejandro Fernandez in Las Vegas is being touted as one of the career-defining concerts of the Latino singer. Having had such an eminent career, long-time fans can only expect another exceptional performance from this master of Mexican music. County music fans in Las Vegas will have a chance to see Rascal Flatts when they perform live at the Venetian Theatre in October. The opening night will be on 6th October 2017 and the thrilling live performances will run for 8 days. Read on to find out why shouldn’t miss this live country music tour. Rascal Flatts is one of the most popular American country rock bands that has been entertaining fans for almost two decades now. The band comprises of Joe Don Rooney, Jay DeMarcus and Gary LeVox. These are three talented individuals who have achieved milestones and reached heights ever witnessed before. The trio has become a long way selling over 7 million tickets and over 20 million albums since 2004. All their albums have achieved a platinum or multi-platinum status and each of them is ranked among the Top 100 Albums of the Decade. They became the top-selling digital and physical artist in 2006 in all genres. When it comes to awards, the group has won several of them including People’s Choice, AMA, CMA, and ACM among others. The notable ones include Vocal Performance and Country Song of the Year. The group will be taking the country music world in the heart of Las Vegas by storm again in October. They will be accompanied by Kelsea Ballerini, one of the most celebrated American singer and songwriter. The group singing all hit songs including What Hurts The Most, Bless The Broken Road and many others will be a good experience to remember. This is the country music tour of the year which you don’t want to miss. Coming to the Las Vegas stage at The Orleans 9,500-seat arena this August 27 is Kool & The Gang’s Keepin’ The Funk Alive Tour featuring Bootsy Collins and Morris Day and The Time with special guest MC Doug E Fresh. Kool & The Gang’s been bringing jazz, R&B, Soul, Funk and disco to the world since 1964 when they formed as the Jazziacs in Jersey City, New Jersey. Their sound has progressed from a pure jazz to a modern electro-pop sound in the post-millennium. Check out our selection of Kool & The Gang’s Keepin’ The Funk Alive Tour tickets on the vegastickets easy to use website here. Kool & The Gang have sold over 70 million album worldwide and are considered pioneers in their genre in the music industry as well as musical genius’ and giants by their peers. Their music used by various artists and in feature films such as Pulp Fiction, Undercover Brother, Rocky and on the Men in Black: The Album and is continuing to be featured. Morris Day and The Time is an American musical group that features a mix of dance and soul music with elements of rock n roll and funk. Frontman Morris Day is a singer-songwriter, and he and his band received widespread populartiy with hits such as “Jerk Out,” and “Jungle Love.” Doug E. Fresh is a Barbadian born American rapper otherwise known as “The Human Beat Box.” He is the pioneer of the 20-century American beatboxing where the artist can imitate correctly drum machines and other various special effects using only his mouth, lips, throat, tongue and a microphone. This concert tour is going to be off the hook with the range, and caliber of the artists performing live will make this an out of this world epic tour.